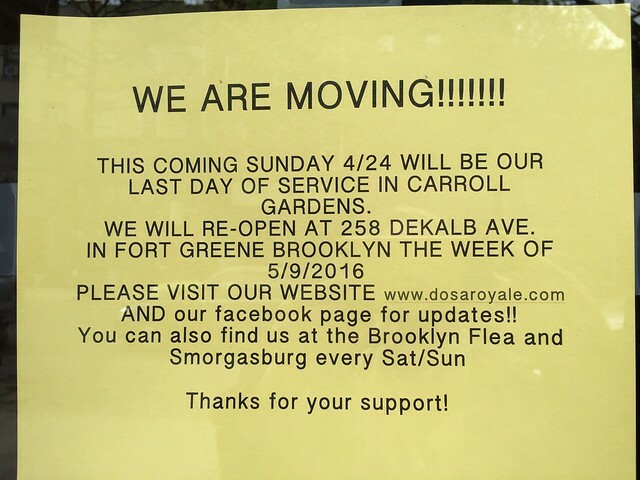 Add Dosa Royale to the long list of businesses that have recently closed their doors on Court Street and Smith Street. Luckily, this does not mean the end for Dosa. 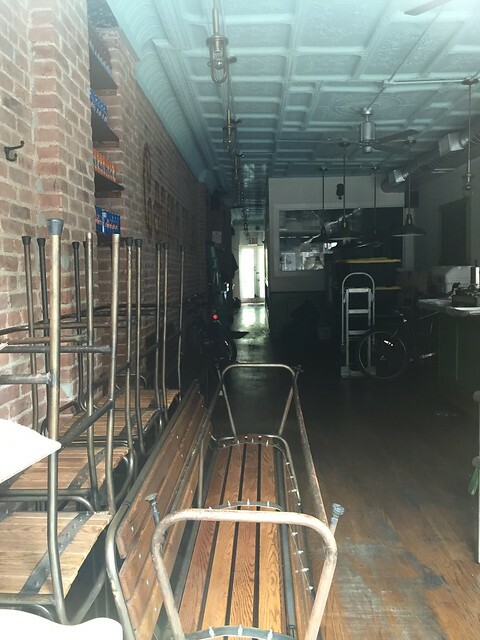 Many of you wrote to PMFA to report that the eatery would be relocating to 258 DeKalb Avenue in Fort Greene. The restaurant, according to a note in the window, will also still be represented at Smorgasburg and Brooklyn Flea every Saturday and Sunday. 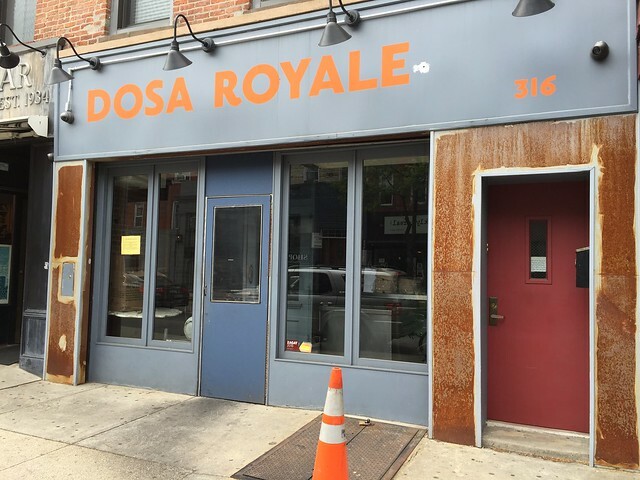 Owners Thiru and Heather Rajamani, who own Dino in Fort Greene as well, opened up Dosa Royale at 316 Smith Street in early 2014. The restaurant served curries and dosas, thin crepes made from black lentils and rice batter that are stuffed with vegetables and served with condiments. It seemed to be popular for a while, but lately, the place was mostly empty when I passed by. 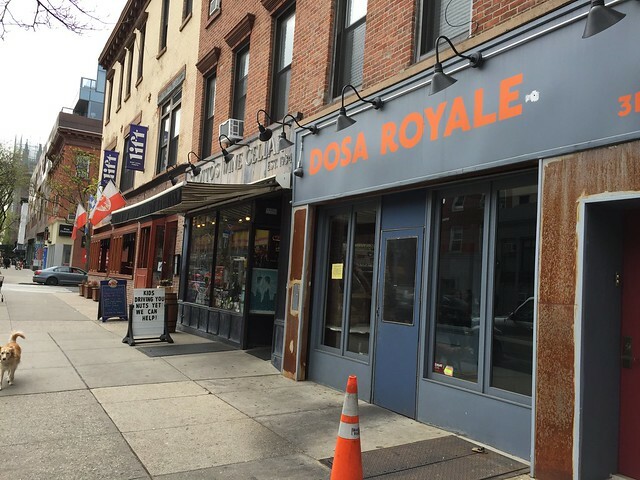 Will you miss Dosa Royale here in the neighborhood? Will you seek out its new location? Who is the owner of the space? I would like to inquire. It really wasn't any good at all. Will not be missed. Of course not. If it were any good, they would have made money and been able to stay. I disagree with the above comment. You have to be kidding me!!! You won't get good South Indian food such as Dosa in a long time in our area. It's a utter shame given that this food was so tasty and actually made by South Indians. Wishing them the best down the road. There are fewer and fewer options in the neighborhood. Soon these haters (Anonymous x2, above) will have to lament some place closing. C'mon, this was a good, unique option in the neighborhood. The Court Street Fair on Sunday was a good indication of the health of the neighborhood (and I know the weather was crummy). At least it sounds like Fragole will be here for another 5-6 year at least (per the guy inside I spoke with). Outrageously overpriced and really mediocre--they thrived on the "hipster" factor. Glad they're closed--they didn't bring anything worthwhile to the neighborhood. Really good dosas would be one thing, but the quality of this place didn't back up the prices. Their "Royale" was usually 2/3 empty and, again, absurdly overpriced. Hopefully a good place takes their spot. Fragole . . . I just don't get it. I've eaten there twice and for the life of me can't figure out why people will line-up for it. But, sigh, I suppose in some respects it beats the constant, and utterly ridiculous, two hour wait times at Frankies and Prime Meats. I just don't understand.. I loved this place.. It was great.. Also why all the hate?.. 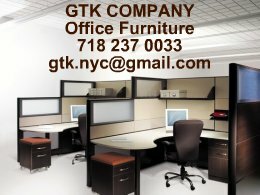 Do you know how hard it is to put all of your dreams and money into a space and belive in it? How scary that is? Good luck to them! We will miss you and come visit you in Fort Greene! in this case, the reason why fragole endures and dosa royale does not comes down to expectations and customer service. nobody expects too much from fragole, other than for it to be reliably middle-of-the-road but in a pleasant, unpretentious manner that evokes the comfort of eating at home. their staff is also competent, friendly and, for the most part, stay out of the way... and then they have a few really good dishes. we don't go there often but whenever my father-in-law is in town, we take him there because he loves it. the floor manager, victor, remembers him and makes him feel welcome. one should never underestimate the importance of that. as for dosa royale, we went there four times, maybe five. we expected well-prepared meals the first time, and we weren't disappointed but the service was careless and the staff was not friendly. furthermore, the prices were steep for what were ultimately meager portions. overall, it felt too precious. we did go back with friends and encountered the same indifference from the staff. over the last two years, i think we've been there twice again, each time wondering if things had changed, but they never did. the food was never bad, but it was never good enough to justify the second rate service. because of that, the prices never seemed justified. i never got the impression that dosa royale cared about its community of diners. i'm sure they did, but we never felt it. that's why fragole survives. it's why the farmacy will likely be around for a while, and it's certainly why bar bruno should be here for sometime to come as well. so many good choices in the neighborhood, where the owners and staff see themselves as part of a community. so, like many of the others, i won't miss dosa royale, but maybe the next stop for them will bring better fortune. I'm far more puzzled by the success of Frankie's than Fragole. It's good food but it's not worth the price, the cramped quarters or the 2 hour wait. Not by a long shot. I'll even take a shot at Prime Meats which is very good. You can get the same quality steak (some days I may argue better) at Libertador for 1/3 the price. I ate at Dosa Royale a few times. It was overpriced, and there was the dosas were half empty; I always left hungry. As for Fragole, the meal I had there was terrible, just incredibly bland. I have no idea how they can stay in business, except that this neighborhood is filled with mediocre restaurants that seem to flourish. Dosa Royale is a lovely place, even if it is trendy, and some of the best, close to authentic Northern Indian food (based upon my experience in India) you will get without traveling elsewhere in the boroughs and in my opinion the neighborhood can't support it because they do not care for it's authenticity. It is not American enough. As a freelancer, I often lunch with friends and many times have suggested Dosa Royale receiving responses of, "I can't handle spicy food," or "Indian is not really my thing." As our community becomes more and more infiltrated with middle-aged wealthy transplants from out of the area who are converting townhouses into single-family homes displacing the students, artists, musicians, actors, writers, teachers and creative people who once rented affordable apartments we will see more and more homogenized and pricey American food like Prime Meats and Buttermilk Channel. Personally, I don't see a huge difference between Fragole's (which has been in the same family with different names for years) and Frankie's in terms of the core of what is on the menu except that Fragole's does it with love, Frankie's with attitude (and I mean that in a good way). When one of my colleague's in-laws were visiting from Italy, she asked me for a recommendation for good Italian. I gave them Savoia (closed) and Fragole as recommendations. 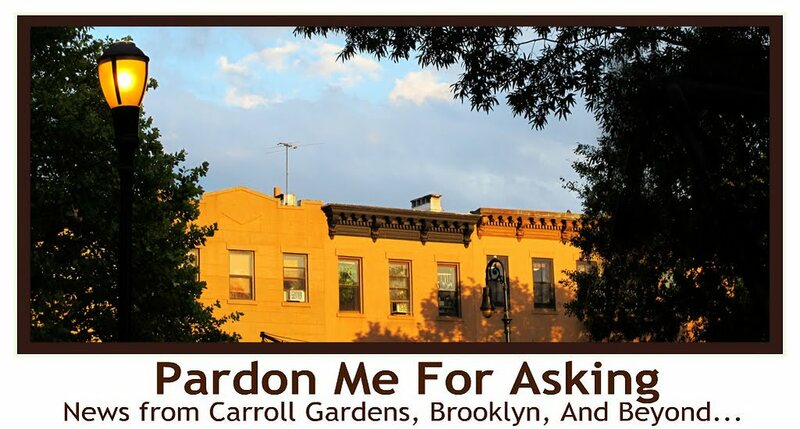 They came from Manhattan to Carroll Gardens and she phoned to thank me, saying her MIL said Fragole felt like the closest thing to eating in a family restaurant she'd experienced outside of Italy and was very pleased. At the end of the day, I think it depends on your definition of authenticity. Disney World is an authentic theme park. For me, Coney Island does a fine job. As the old, family businesses and new family businesses close, replaced by Dunkin Donuts, et al., I will still go to Marquette while my friends who don't care for Dosa Royale and Fragole walk past and collect their points at Starbucks. Different strokes. And BTW, Dassara is closed now too. wow, an aggressive bunch here. why all the hate? Dosa was a unique place with a cuisine that we dont already have a hundred of. I'm sure another burger and pizza place will go in its place - like we need another one of those. I thought they had the best lightest and tastiest dosas in nyc. 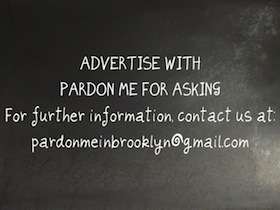 I will go to the fort Greene location. A new establishment will be coming in June. 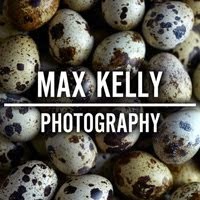 Any idea what it will be? Looks like a bar/restaurant, and not another real estate office, yay! The name on the new liquor license application is Sovi Kitchen, Inc. Applied as an Italian-American eatery. Any reviews on the new restaurant , Gersi ?